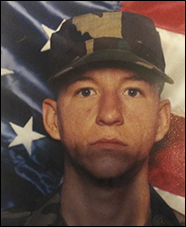 Army Specialist Reginald McGibbon joined the military in February of 2000 out of New Orleans because he said he wanted to provide a better life for his family while serving the country that he loves. He was honorably discharged in 2005. Over his five years of deployment, Specialist McGibbon sustained many physical injuries. He had also witnessed many atrocities that caused psychological trauma, which has made for a very difficult transition to civilian life. For his years of service, Specialist McGibbon has been awarded the Army Commendation Medal, Army Achievement Medal, Presidential Unit Citation, Army Good Conduct Medal, National Defense Service Medal, War on terrorism Expeditionary Medal, Kosovo Campaign Medal, War on Terrorism Service Medal, Army Service Ribbon and the NATO Medal. Specialist McGibbon, his wife Techer and their daughter Essence were gifted a mortgage-free home in Harvey, Louisiana.